You may or may not know that I have quite a number of nail polishes. If you wish to see my 2013 nail polish collection, you may click here. Anyway, I do have a few and sometimes I feel like my nail polishes are starting to feel bad because I don't get to use all of them a lot. The only thing that they can be thankful for, if they can, is that I store them well and never get them near direct air, sunlight or heat. I take care of them so well that most of my nail polishes are the ones that I bought when I was starting. And that was over 2 years ago! You may also have some bottles, like I do, and may be wondering how else you could use them aside from your nails. My favorite hack is applying clear nail polish on fake jewelries! I am a very acidic person so my fake golds and silvers always tarnish! When I started coating them with polish, I noticed that they remain shiny and tarnish-free even if I wear them a lot! Also, I often find some of my photos on Pinterest and Buzzfeed. So from now on, I'll be making some fun collages for each project so readers could easily pin and repost my photos. Just don't forget to credit or tag me, okay? Okay. Here is a simple collage/guide! 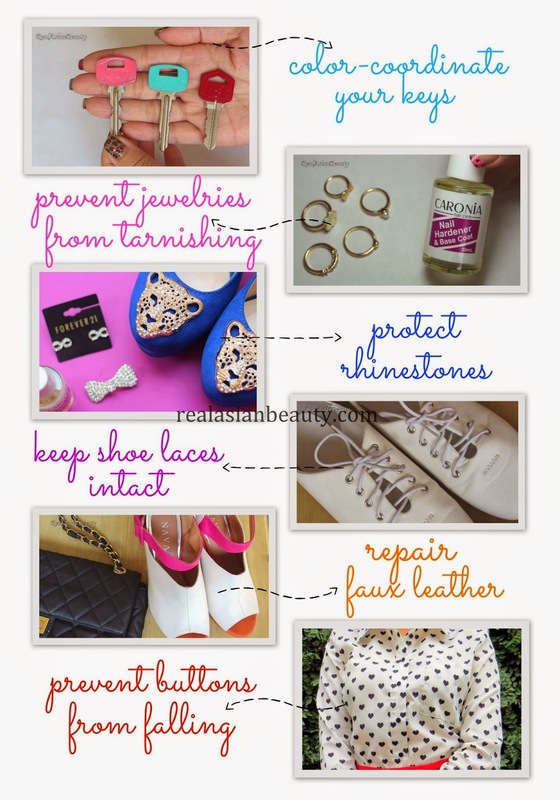 I hope you like the simple yet super efficient nail polish hacks!